Yorking Hardwood have been engaged in source and milling short leaf acacia in South china over 12 years beeing one of largest raw acacia timber trading and prefinished acacia flooring , acacia stair tread, stair nose,acacia engineered flooring as well as acacia skirting board and wood trims. Many other chinese factory located around Shanghai,Nanxun established stable business relationship with us,purchasing the Non-dried acacia lumber or rough sawn plank in different grades.The highest AA grade acacia wood plank are used for veneer peeling to produce acacia engineered hardwood flooring. Raw acacia wood plank(mc 14%-18%) has to be strictly dried inside oven to control the moisture content under 11% to for inetrior hardwood flooring use.Although acacia is a strong & impressively beautiful hardwood, unproperly moisture control often lead to excessive movement or cracking after flooring plank installation. Many low price acacia flooring supplier often rush for short time delivery without sufficient oven dry,excessive moisture content is a killing point after the hardwood flooring installtion. 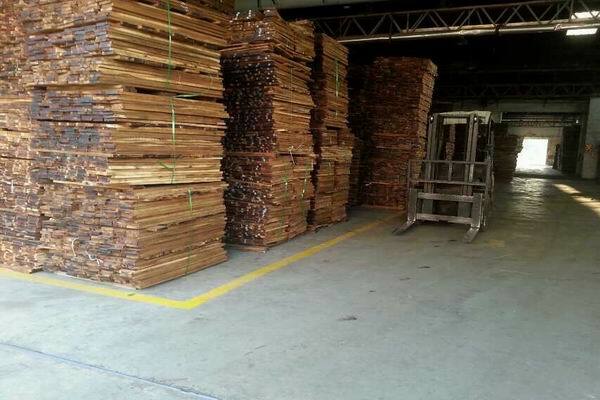 We do second drying procedure on our own oven drying facility to control MC at 9%, we offer SGS inspection service during production to offer stable quality prefinished acacia hardwood floors. In short , the first hand lumber cost from source place & directly milled acacia gives us key advantage both on price and quality exporting acacia flooring to over seas market.